This new study was performed by a bunch of research groups from several universities, such as Georgetown University, The University of Michigan, Yale University and some health organizations like VicHealth Centre for Tobacco Control, The Roswell Park Cancer Institute, and even the Truth Initiative. If you’re familiar with some of those names and where this study was published, you’re probably as surprised as I am that this is a positive study. BMJ’s Tobacco Control is notorious for publishing anti-vaping studies and groups like the Truth Initiative have been fairly anti-vaping too. So this is really surprising. But let’s get into the study. The researchers went into the study with the knowledge that while tobacco control policies are effective in reducing smoking rates, the impact is slow. They wanted to find out if a strategy of switching smokers to vaping could speed up the process and if so, by how much. They used what’s called a Status Quo Scenario, which means considering what would happen if they did nothing at all and what the consequences of that would be. So basically, what would happen if smokers didn’t switch to vaping. They used smoking rate data up to the year 2012, which was before vaping became popular so that they had a more accurate projection of how smoking rates would change if people weren’t vaping. Then they compared those results with a substitution model, which is the exact opposite – what would happen if they did switch smokers to vaping to help them quit over the next 10 years. They also considered both an optimistic scenario and pessimistic scenario. In the optimistic scenario, they considered current e-cigarette use patterns and published research. 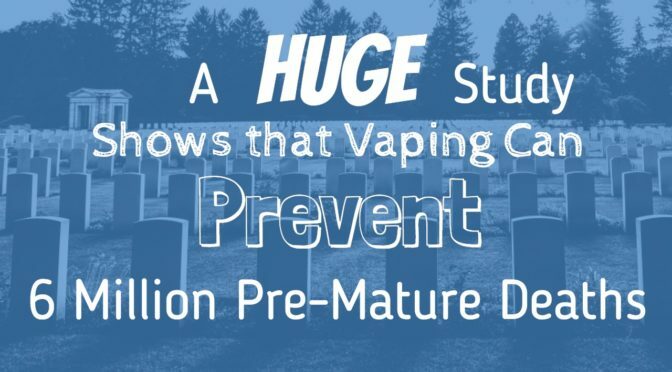 They found that by switching smokers to vaping, they would prevent 6.6 million premature deaths in just 10 years with a total benefit of 86.7 million years. In the pessimistic scenario, they considered a worst-case scenario, for example that vaping is even more harmful than current research indicates. In this scenario, they would still prevent 1.6 million premature deaths with a total of 20.8 million years saved. Even under pessimistic conditions, they could prevent millions of early deaths. The researchers came to the conclusion that switching smokers to vaping could save at least 1.6 million people and up to 6.6 million people from dying early due to smoking. Now that’s a slap in the face of the former surgeon general who stupidly vilified electronic cigarettes in his report last year. This is a very positive study, performed by many reputable schools and well-known organizations here in the United States, which is an important thing to note because regulators in the past have used the excuse that studies from other countries are not relevant to the United States, which is complete bull and makes no sense at all, but now what can they say? I’m excited to see how this research might impact the views of health organizations and policy-makers in the future.